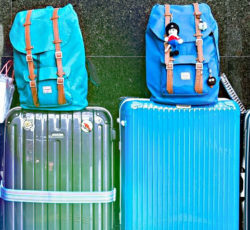 While most of know you need to carry travel size liquids in a clear quart-sized bags, there are other things that we don’t think about. Neglecting to prepare for regulations and procedures will cause you a lot of headaches. If you are traveling there are certain things you should consider before flying. Know if your carry-on is too big. The airline will check, especially on a full flight. Gate agent may measure your bags, but seasoned agents can spot a large bag by eye. Keep in mind that even if it is the right size, you still may be asked to check it on a budget airline or a flight that is at capacity. The general rule is that your carry-on should be under 22 inches high, 14 inches wide and 9 inches deep. You also allowed a personal item such as a purse, laptop/tablet bag, or stroller. Be sure not to pack items that are prohibited for your carry-on items. Liquids – You can bring 3 oz. or less of various liquids that fit inside one quartz-sized clear bag. Water, drinks or perfumes bought in the secure zone of the airport are allowed on the plane. All other liquids should be placed in your checked baggage. Razor Blades – Packaged ones are OK in checked baggage, and blades on a razor are Ok if sheathed. Straight razors are not allowed. If you have any questions, please check with your airline or the TSA to make sure you can carry an item on board the plane. Before your trip, be sure to make sure you have all your documentation in order when traveling to another country. Use the following checklist to help you. Make sure your passport is still current. You need to have at least six months left to travel. Check to see if the country accepts your driver’s license if you are going to rent a car. You may need an international driver’s license. Some European countries require what is called a vignette, which is a road tax sticker. When reading a car make sure this is included, or you may get a ticket in the mail. Bring the right credit cards. Some banks are giving you credit cards without raised numbers. Some car rentals places and store in Europe will not accept this type of card. Make sure you have at least one card with raised numbers. A “no fee” or a free special issuance passport will not allow you to travel any but the country where your spouse is stationed at for the military. Be sure to check with the health department. You may be required to receive certain vaccinations to travel to specific destinations.